The third season of Syfy's supernatural TV series is planned for Blu-ray release this September. In an early announcement to retailers, E1 Entertainment has slated 'Sanctuary: The Complete Third Season' for a high-definition release on September 13. The show is filmed almost entirely with green-screen and originally started as a webisode series on the Internet. 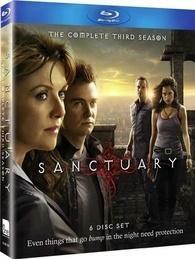 The Blu-ray release will be a six disc set with all twenty episodes in 1080p video, a DTS-HD Master Audio 5.1 soundtrack, and supplements include: Commentary on Select Episodes, Visual Effects of Sanctuary Season 3, Amanda Tapping Directs "One Night", Hollow Earth, Damian Kindler: In the Director's Chair, The Music of Sanctuary, Behind the Scenes: Normandy, Character Profile: Nikola Tesla, and Outtakes. Suggested list price for the Blu-ray set is $64.98. You can find the latest specs for ' Sanctuary: The Complete Third Season' linked from our Blu-ray Release Schedule, where it's indexed under September 13.